The first AOPS, named HMCS Harry DeWolf, is scheduled to be delivered to the Royal Canadian Navy in 2018. Image courtesy of Irving Shipbuilding Inc.
Steel-cutting of the HMCS Harry DeWolf ship was held in September 2015. Image courtesy of Irving Shipbuilding Inc. The first ship in the Harry DeWolf Class AOPS is being built at the Halifax Shipyard. Image courtesy of Citobun. The Canadian Government is procuring a fleet of six ice-capable Harry DeWolf-Class Arctic/Offshore Patrol Ships (AOPS) to enhance the Royal Canadian Navy’s maritime surveillance capabilities. The first ship in the class entered the construction phase in September 2015 and is scheduled to be delivered in 2018. The patrol vessels are intended to conduct armed seaborne surveillance and sovereignty in Canada’s exclusive economic zone (EEZ), as well as on the Atlantic, Pacific and Arctic coasts. They are also capable of assisting the Canadian Coast Guard and other units of the Canadian Armed Forces in maritime support missions. The lead ship in the class is named HMCS Harry DeWolf and the subsequent ships are named HMCS Margaret Brooke, HMCS Max Bernays, HMCS William Hall and HMCS Frédérick Rolette respectively. The Canadian Government awarded a $9.3m preliminary contract to Irving Shipbuilding in July 2012 to review the design and specifications of the existing AOPS developed by Canada. In March 2013, Canada and Irving Shipbuilding signed a definition contract worth $288m for the completion of the design phase of the vessels. The tasks performed under the definition contract were project management, three-phase engineering design, project implementation proposal document, test production module, and long-lead items procurement. The Canadian Government and Irving Shipbuilding signed a $2.3bn contract for the construction of six AOPS as part of the National Shipbuilding Procurement Strategy (NSPS), in January 2015. 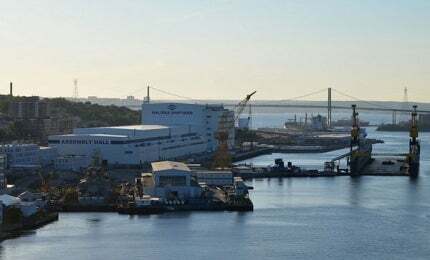 The ships will be built by the prime contractor Irving Shipbuilding at its Halifax Shipyard in Nova Scotia. The hull of the Harry DeWolf-Class vessels is designed to meet IACS PC 5+ requirements. Each vessel will have a length of 97m, beam of 19m, draught of 5.7m and a displacement of 5,800t. It will accommodate a crew of 45 members and will carry up to 40 people additionally. The vessels can carry 8.5m-long multi-purpose rescue boats with a maximum speed of more than 35kt for rescue, personnel transfer and boarding missions. They can also deploy a 12m RCMP/JTF2/Navy mission-fit boarding/assault boat. The vehicle bay houses pick-up trucks, all-terrain vehicles (ATVs) and snowmobiles. The flight-deck, located on the stern, supports operation of a variety of helicopters ranging from a small utility aircraft to the Royal Canadian Air Force’s CH-148 Cyclone maritime helicopter. The enclosed forecastle at the forward part of the ship is meant for protecting the foredeck machinery and workspace in challenging Arctic conditions. The AOPS can be integrated with payloads such as underwater survey equipment and shipping containers. A 20t crane with self-loading and unloading capability will also be fitted on the ship. The integrated bridge system of the Harry DeWolf-Class ships will serve as the controlling and operating station. The bridge will be fitted with navigation systems, damage-control systems and machinery. It will have multi-purpose operational space to support mission execution and operation-planning. The ship will be equipped with modern surface search radars and state-of-the-art sensors. Its command, control and communication capability will facilitate transmission of real-time information between the AOPS and the Canadian Armed Forces Maritime Security Operations Centres. The offshore patrol vessels will be armed with BAE Systems’ remote-controlled 25mm MK 38 machine gun, which features an M242 cannon and a highly accurate gun targeting and surveillance system. The power plant of the Harry DeWolf-Class patrol vessels will consist of two 4,500kW main propulsion motors and four 3,600kW generators. A bow thruster will be installed in the bottom of the vessel enables berthing or manoeuvring without using tugs. The retractable active fin stabilisers will reduce the roll motion of the ship. The vessel will have an open water speed of 17k and endurance of 120 days, and will reach a range of 6,800nm at a speed of 14k. It will be capable of operating in 1m-thick ice. BAE Systems was awarded a contract by Irving Shipbuilding to deliver six modified 25mm MK 38 machine guns, spare parts and support services for the AOPS in August 2015. Irving Shipbuilding awarded an implementation subcontract to Lockheed Martin Canada to integrate command and surveillance system into the AOPS. Irving Shipbuilding also awarded subcontracts to GE Canada for the integrated propulsion system, Lloyd’s Register Group for classification of the vessels, Odense Maritime Technology (OMT) for marine engineering and naval architecture, and Fleetway for integrated logistics support.